In this puzzle, the pieces composing the cross may be made of pasteboard, but are better and stronger if made of the white holly or other thin "bracket wood." Cut three pieces—with the jig-saw, of course—in shape like Fig. 1, one piece like Fig. 2, and one like Fig. 3. 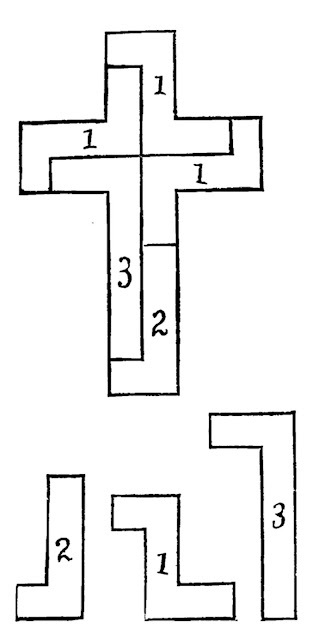 These pieces may be of any size, but relatively each one must correspond with the sizes and shapes indicated in the diagram. Paint as fancy may dictate, after smoothing the edges off with sand-paper. Pack in a box treated.